PACE Commissions, Royal Aberdeen Children’s Hospital, Aberdeen, 2004.
Review first published, ‘a-n’, November 2004. One can be forgiven for approaching art in hospitals with trepidation. As we all know, artwork can be at its most mawkish in such an environment: on a background of puce, tremulous line drawings of foreign sunspots meet perennial nativity scenes in watercolour, as if, through a doltish act of schadenfreude, the hospital intends to convey to patients and visitors alike that any where and any time is better than the grim here and now, but at least there might be a God. Then again, it is no surprise that hospitals can play host to abjectly sentimental work. After all, what is more antipathetic to serious artists, some might ask, than the quaint idea that they should exploit a general palliative quality of their visual work on behalf of clients who are strangers to the family of contemporary art? To do so would require the meaningful artist to contemplate the impact of certain nice arrangements of their media – just what their faux-radical MFA tutor told them was bunk. With such precedents and tensions in mind, what has happened at the Royal Aberdeen Children’s Hospital, although not an isolated case (cross-check with Belfast and Bristol), is genuinely noteworthy. We do not have the work of consultant-knowing, god-fearing neighbourhood amateurs; we have the work of fifteen serious and independently successful artists. That is not in itself any good, granted, but this project is more than a collection of bits and bobs graciously given by art stars. For this boldness of selection and control of installation credit should be given, chiefly, to Jackie Simpson, Chair of RACH Arts Project Group, and Juliet Dean, Director of buisarts agency, PACE. They have successfully managed the £600,000 venture, funded by Scottish Arts Council Lottery Funds, Aberdeen City Council, NHS Grampian and the Archie Foundation. Noticeably, with crucial consultative input from the Young Advisers Group (comprising children from seven schools in the Aberdeen region), the RACH Arts Project Group and PACE have bravely encouraged the artists to address the building as a hospital. Where lacklustre hospital art has tried in the past to visually enchant in order to distract, many pieces in this collection do not shy from the potential discomfiture of the medical context. Allan Watson has carefully crafted substantial wooden seating to improve the quality of waiting for patients, and especially families; a waiting which can, of course, be informed more by anxiety than fatigue. Nick Veasey has produced two-way lenticulars which humorously explain what happens under X-ray; at a glance we see a well-worn teddy bear, at another we see the polystyrene beads which make up its heart and soul. Lucy Richards’s textual work presents readable and talkable and unbelievable biological facts. Julia Griffiths Jones has subtly rendered, in metal wire, a child’s dress and a 1920s nurse’s apron which visually reference, respectively, naive drawings and medicinal herbs. Although less context specific, other pieces equally stimulate. Jim Buckley’s ambitious contribution is a giant Slinky tower, which, thanks to its optical fibres, will make the dark nights less oppressive for in-patients. Jane Watt has installed a striking and serene ‘wall’ made from 58,500 pearlescent buttons. 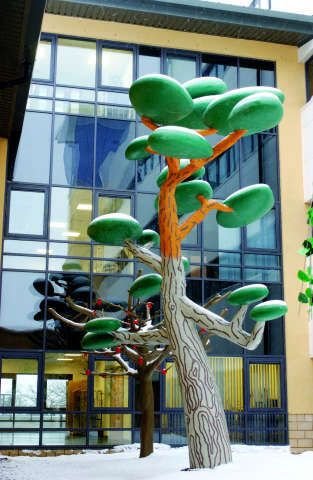 And Dalziel + Scullion have constructed cartoon-like trees out of fibreglass, which, despite their imaginative origin and colourful appearance, seem nevertheless to be rooted and real and very much part of the fabric of the hospital. These works, and the rest, including pieces by Michael Brennand-Wood and Georgia Russell, are not all freely accessible to Joe Public, understandably, but together they add up to an audacious and commendably integrated benchmark series of artworks which, with not a patch of puce in sight, will stimulate and engage patients and visitors for a long time to come.